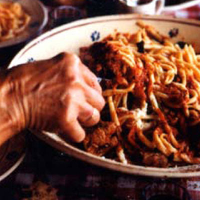 In Calabria, this ragu is tossed through fresh pasta, such as fusilli ai ferri (knitting-needle fusilli), a hollow, spaghetti-like pasta made by rolling the fresh dough around knitting needles or rods before it’s laid out to dry. Season the beef. Put the olive oil in a large casserole and set over a medium heat. Brown the beef on all sides, then remove to a plate. Add the onion and cook, for 5 minutes, stirring. Then add the garlic and chilli and cook for a further 1 minute before adding in the wine, tomatoes, the beef and any juices. Ensure all the meat is covered by the sauce; if it’s not, top up with a little water or stock. Bring to a simmer, then reduce the heat to very low, cover with a lid and let the ragu bubble away very gently for about 2 hours, until the beef is very tender. Check a couple of times during cooking to ensure the beef remains covered by the liquid; if not, turn the meat and top up with water or stock. With two forks, tear the beef into chunks, then add the basil leaves and adjust the seasoning if needed.